The Villa Maria at the Hawkhill Resort is so charming you’ll want to stay forever. Rustic and charming, this small log cabin is surrounded by beautiful forests and lovely scenery, so perfect you’ll never want to leave. The Villa Maria is a family sized vacation cabin on a small lake west of Helsinki, Finland. The log cabin is quite modern looking, but it still has a traditional appeal because it was built using traditional log home building techniques. The logs were scribed to fit together perfectly and then joined using Scandinavian saddle notches at the corners. It’s a total of 969 square feet with two bedrooms and a den and one bathroom. There’s even a private sauna that guests can use to refresh and unwind. The cabin’s main living area is a great room facing the lake with comfortable sofas that can be rearranged to accommodate the renters. Directly behind the living area is the dining area and kitchen which provides all of the necessary amenities to cook meals and enjoy them. There’s also a nice wood burning stove to enjoy cozy fires. The two bedrooms are just off of the kitchen area both with two twin beds, and there is a two-piece bathroom, but the shower is close to the sauna. The rustic sauna can be accessed through the den and a small laundry room that is entered from outside. Wouldn’t that be a wonderful way to start or end the day by sitting in a nice, warm sauna? There’s also a large patio and a covered porch that would be great for dining or relaxing. Plus, there’s even a log barbecue hut with a handcrafted brick barbecue. Just steps from the cabin is the beautiful lake which can be enjoyed during the summer. It’s a private beach, and there’s also a rowing boat that can be used for the duration of the stay. Some people even enjoy plunging into the cold lake water after sitting in the sauna. The resort also rents out baby cribs for any infants that you may be travelling with. They’ll also rent out snowshoes and kicksleds for some winter fun or a kick-bike or mountain bike in the summer. Besides the Villa Maria, they also have a few other log cabin rentals available and a larger home that can be rented out. There are plenty of fun and relaxing things to keep you busy and having fun while staying in the cabins or home, and the staff is more than willing to help their guests any way they can. If you love vacationing and exploring accommodations that are out of the ordinary, staying in a log cabin like the ones at Hawkhill is a great idea. 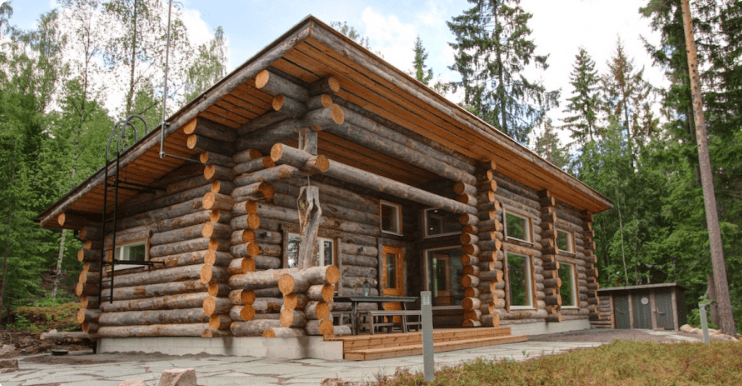 It’s an especially great idea if you’re interested in building or buying a log cabin of your own, or if you’re just interested in and fascinated by log homes and cabins. Would you love to take your loved ones to a cabin like this for a relaxing and rejuvenating vacation? It’s sure to make memories that last a lifetime.